May 15, 2012 Culture » Big Shiny Robot! Villains—in comic books, certainly, but in narratives in general—are always the best characters. The best heroes are often as defined by their archenemies as they are their identity. Batman is defined very much by the Joker. Superman is defined by Lex Luthor. Spider-Man has the Green Goblin; Daredevil has the Kingpin; Captain America has the Red Skull. But there are villains that transcend any one hero. They are a menace to all. Dr. Doom comes to mind, for sure. He started as a villain in the Fantastic Four comics, his origin inexorably tied to that of Reed Richards, but everyone knows Doom. He’s fought against Spider-Man, the Avengers, Galactus, the Beyonder and anyone else you can think of. Victor von Doom is one of my favorites, which is why I was so disappointed by his appearance in the Fantastic Four movies from the past decade. He has such an arrogant bluster, you simply can’t help but like him. And he rules his own country, so that’s very cool, too. There are other fantastic villains who fit that mold, though, who are much more lethal, but slightly less well-known. One you’ll most likely be hearing a lot about is a guy named Thanos. Who’s that, you ask? 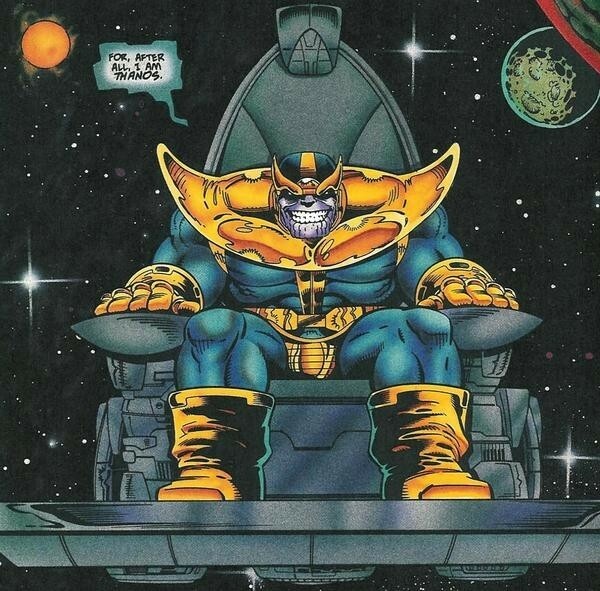 Thanos is known in the Marvel Universe as “The Mad Titan.” His name comes from the Greek personification of death, Thanatos. His story is much like Greek tragedy. He was born on Saturn’s moon of Titan, different from the others of his race, and grew thirsty to set himself apart. But along the way, he fell in love with the one being who would not return his love: Death. In a desperate attempt to woo his lady love, Thanos decides he must provide her with souls as tribute. His goal is to achieve enough power to kill enough people to gain her affection. Perhaps his most notable appearance is in the Marvel Comics miniseries The Infinity Gauntlet. The Gauntlet is a powerful weapon that contains the Infinity Gems, and is so popular, it even made a cameo in Odin’s armory in the Thor film in 2011. With the gauntlet in his possession, Thanos once wiped out half the population of the universe with a snap of his fingers after being scorned by Mistress Death. It took pretty much every hero in the entire Marvel Universe to fight him, and those are always the best fights to watch, as The Avengers proved. Since his powers approach omnipotence, the battles always reach cosmic scales. Like Dr. Doom, though, Thanos isn’t above defending the universe if he’s not the one subjugating it. If you want to read more about Thanos, go out to your local comic-book store and pick up a copy of The Infinity Gauntlet. Another good one to snag would be The Marvel Universe: The End. And if you can somehow manage to find a copy at a reasonable price, check out The Thanos Quest. More recently, Thanos has appeared in video games and the kids cartoon The Super Hero Squad Show. On that show, he’s adorable and evil (though he worships Chaos instead of Death). Kids should recognize him by now. In one of my favorite episodes of that show—yes, it’s a kids show, but I still like it—Thanos teams up with Dr. Doom to break into the headquarters of the Fantastic Four, the Baxter Building. He’s a great character and you should, at the very least, keep your eye out for him. You never know where a guy like Thanos is likely to pop up.